It’s hard to believe that the Nexus 6 is the Nexus 5’s successor. There’s a huge difference between these two devices in almost every department, but this year you’ll pay for those changes. Today we’re comparing the Motorola-made Google Nexus 6 to the LG-made Nexus 5. The Nexus 5 was a steal of a deal when it was first released. In fact it’s still a great device. For the money, it’s hard to find a comparable device with the same software experience. The Nexus 5 is loaded up with Android 5.0 Lollipop (update is coming soon) and even after being outdated by better specifications and other smartphones on the market, it still runs like a boss. As for specifications, Google’s Nexus 5 features a 4.95-inch IPS display with a resolution of 1,920 x 1,080 coming in at 445 ppi, a quad-core Snapdragon 800 processor clocked at 2.3GHz, an Adreno 330 GPU, 2GB of RAM, and a 2,300 mAh battery. These specs may seem a little behind the times, but don’t underestimate the optimized power of Lollipop. The Nexus 5 is still buttery smooth. This year, Google and Motorola have teamed up to bring us the Nexus 6 and there’s quite a lot happening with it. While the software experience is similar when compared to the Nexus 5, everything else has been revamped to stay up-to-date with the demands of consumers and the high-end specifications available on the market. Google’s Nexus 6 features a 5.96-inch AMOLED display with a resolution of 2,560 x 1,440 and provides 493 ppi. Inside we have a quad-core Snapdragon 805 processor clocked at 2.7GHz, 3GB of RAM, the Adreno 420 GPU, and a 3,220 mAh battery. In terms of specifications alone, the Nexus 6 is going to live up to today’s standards and hold its own against flagships like the Galaxy Note 4 and iPhone 6 Plus. As mentioned before, there’s a big difference between these two smartphones. If you haven’t noticed by now, the display is 1-inch larger. Now this doesn’t mean much in terms of actual software functionality, but in certain situations you will be able to see more at once. The main benefit from such a high resolution pixel-packed display is going to be its clarity and size. Each year Google tends to use a difference company to create its Nexus devices. Because of this, we’re provided with a different design each time. There is literally no resemblance between these two devices. With the Nexus 6, Google hired Motorola to take care of the build quality and design and I couldn’t be happier. This is a very well-built device. The Nexus 6 is basically a refined and blown up version of Motorola’s 2014 Moto X, but that’s not a bad thing in any way. We have a curved aluminum frame and a hard plastic back side with the Nexus and Motorola branding. It feels great in the hand and is easily one of the best constructed Android devices in 2014. 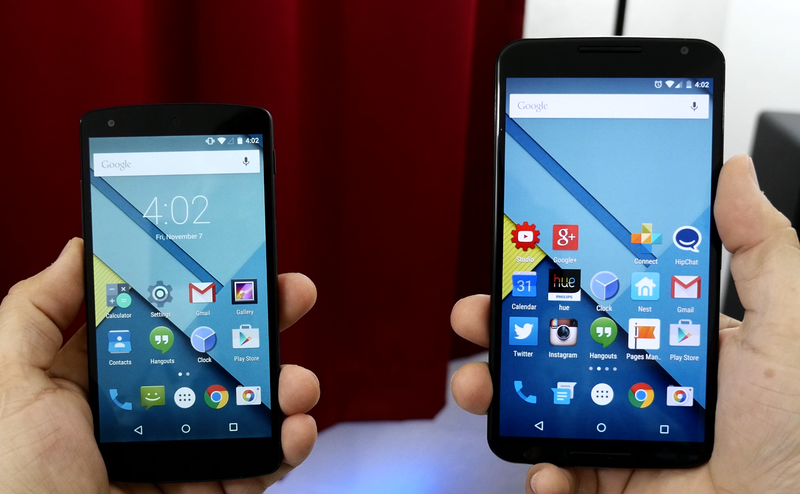 Nexus 6 vs Nexus 5. On the Nexus 6 layout, you’ll find a 3.5mm headphone jack on the top, while the bottom makes room for the Micro USB charging port and a small microphone. On the right side we have the volume rocker, lock button, and a secondary microphone, while the top is home to its Nano SIM card tray and 3.5mm headphone jack. On the front side we have a 2-megapixel camera, sensors, an earpiece, and dual front-facing stereo speakers. There’s no LED notification light on the Nexus 6, but it features “Ambient Display” mode which will light up the screen using only white pixels to show notifications when they arrive or when picking up the device. Finally, on the back we have a 13-megapixel shooter with optical image stabilization that’s capable of shooting up to UHD video quality, a dual-LED flash in a ring diffuser setup, and our Nexus branding with the Motorola logo centered in a finger-sized dimple. 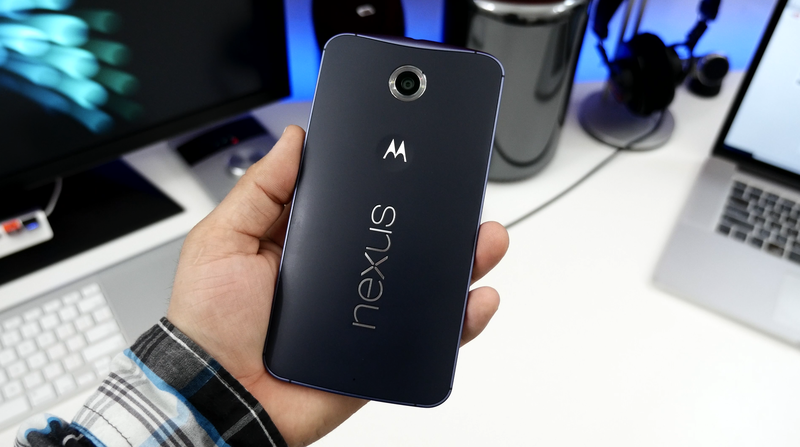 Google’s Nexus 6 wins in build quality. Moving over to the Nexus 5, we have a soft-touch plastic finish all around. There’s nothing bad about the Nexus 5’s design, but there’s also nothing superior about it. It still feels comparable with the smartphones of its time, but overall the Nexus 6 wins in the build and durability department. As for the Nexus 5’s layout, on the top we have a 3.5mm headphone jack and a microphone, while the bottom is home to a speaker, microphone, and Micro USB charging port. On the left side we have our volume rocker and moving along to the right side you’ll find the lock button and Micro SIM card tray. On the front above the display, you’ll find an earpiece. a 1.3-megapixel camera, and the LED notification light. Finally, on the back side we have Nexus and LG branding present along with an 8-megapixel camera and LED flash. It’s also important to note that both of these devices feature wireless Qi charging, but the Nexus 6 also comes packed with a special Turbo Charger from Motorola that will provide up to 6 additional hours of battery life from a single 15 minute charging session. As for camera performance, the Nexus 6 offers some improvements over its predecessor. Depending on the lighting, there can be a noticeable difference between these two cameras. The Nexus 6 offers a better 13-megapixel sensor with optical image stabilization and colors seem to be more accurate than the Nexus 5’s 8-megapixel shooter. Daylight photos are very close in quality under certain conditions, but low-light seems to break up the clarity on both devices. Check out the camera samples below. You’ll be surprised at how the two galleries compare. For video, the Nexus 6 shoots up to UHD quality and its stabilization is definitely more noticeable than the Nexus 5. High resolution video may not be for everyone, but it’s always nice to have the extra pixels to work with. On the Nexus 5 we have up to 1080p video recording but it’s nothing to brag about. At the end of the day, it’s just okay. There’s nothing too special happening here with the video quality, but leave us your thoughts below. When it comes to the software experience, you won’t find much different between these devices. They are both running Android 5.0 Lollipop and offer a smooth and pleasant interface with snappy animations and fluid transitions. In my testing, the Nexus 6 can still hold its own in overall performance when navigating through the user interface. I was actually quite surprised how well the Nexus 5 performed when compared to the Nexus 6. As mentioned, there’s a big difference in specifications between the two, but it’s clear that you’re mostly paying for the latest specifications and the build quality if you choose to go with the Nexus 6. 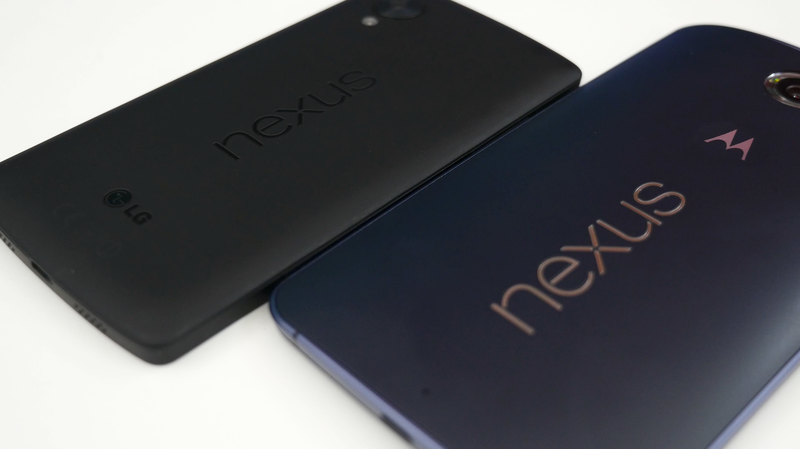 I’m a big fan of Lollipop, but at the end of the day Lollipop is still Lollipop and a Nexus is still a Nexus. Whether you’re using a Nexus 5 or a Nexus 6, you’ll still get the same smooth unadulterated Android experience from Google. The software experience is very similar between these two devices. Geekbench tells its own story when comparing benchmarks, but that’s not always a big deal to everyone as normal everyday use will yield comparable results overall. Don’t get me wrong, the Nexus 6 is a very quick device, but that doesn’t mean the Nexus 5 will be left in the dust. The Nexus 6 is a fantastic device all around. There’s no denying that most of its flagship characteristics outweigh those found on the Nexus 5, but you’ll also pay for those changes. Google’s Nexus 5 has been known as one of the best budget Android devices money can buy. Coming in at just $349 for the 16GB model, it’s a hard one to pass up. If quality is what you’re looking for, the Nexus 6 offers best in class design and performance. On the inside and outside, it’s a much better device, but it’s also very large and will set you back $300 more than its predecessor. It’s clear that the Nexus 6 is a 2014 flagship and Google has priced it accordingly. Like it or not, there’s nothing “budget” about it. If you’re looking to save a few bills and crave a smooth Lollipop experience, the Nexus 5 is for you. If screen size, build quality, and specifications are at the top of your “need-to-have” list, the clear winner will be Google’s Nexus 6. I can’t make this decision for you, but hopefully this comparison has provided enough facts and detail to make it a bit easier. What do you think? Let us know which device is your favorite down in the comments section.